Nason Moretti mouth-blown Murano glass Guepiere champagne flute. Hand wash. Made in Italy. 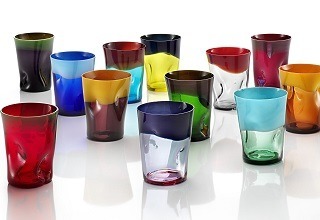 Handmade in Murano, Italy, the colors and forms of NasonMoretti glass are as sumptuous as confections. NasonMoretti artfully balances the centuries-old tradition of Murano glassmakers with a distinctly modern and understated design ethos; clean lines and and subtle ornament allow the pure beauty and vibrant color of the glass to shine through. Each piece of stemware is made by hand, ensuring the peerless quality that makes these glasses a joy to use. Designer Carlo Moretti’s work can be found in museum around the world; NasonMoretti brings museum-quality glass to your elegant table.